After an untimely detonation by NYXL’s Academy Team this offseason, Mayhem Academy wasted no time in picking up the pieces as they have now secured the services of Liam “Mangachu” Campbell for the next season of Overwatch Contenders: North America. Mangachu seemed a little conflicted to leave his surroundings at XL2, but he seemed just as excited to start his new journey as a member of Mayhem Academy as he continues his quest to be the best player he can be. As soon as XL2 made their surprising changes for ‘local’ talent within the league, the antennas quickly went up for every other team in the Contenders scene desperately wanting to improve their roster. For a few years now, Mangachu has developed himself into a fearsome DPS threat with his consistently high finishes as a part of Team Canada, as well as his ever improving form with Contenders teams. In just a few years since his debut, Mangachu has crafted his own personal lane in the Overwatch scene with his massively diverse hero pool and expansive threats on projectile and hitscan heroes alike. Not just that, but Mangachu has also developed a reputation for pulling off moves on heroes that no other pro player would dream of succeeding with. To this day, Mangachu is the only professional World Cup player that has successfully killed an opponent with Torbjorn’s hammer. This stunt, pulled off during the 2017 Overwatch World Cup, has yet to be replicated and likely won’t be done for a few years to come. Mangachu isn’t scared of taking his hero pool to the absolute limit and oftentimes his gambles as a player have put himself in position to reap massive rewards. This next trip en route to Mayhem Academy will once again test his resolve and hopefully he will come out on top triumphantly. Mangachu has been one of Canada’s best kept secrets on the Overwatch Professional scene for quite some time. But if he ever wants to break into the next level as a contender in the Overwatch League, winning in impressive fashion as a new member of Mayhem Academy will be the best way to achieve that goal. Even though Contenders: North America is considered a ‘lesser league’ to the Overwatch League, there are still a handful of candidates that will make victory for Mayhem Academy more difficult than expected. 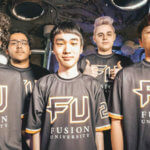 For the past three consecutive seasons, Fusion University has reigned supreme at the Academy level and there’s no sign of stopping in Season Four. Atlanta Reign’s Academy Team has also come out of the gates swinging in their last run in the league, finishing second place after previously not being considered a playoff team with their roster. Mangachu now joins Damon “Apply” Conti, Johannes “Shax” Nielsen and Tim “Manneten” Bylund as part of the DPS core on Mayhem Academy. If all goes well for the Canadian gunslinger at his new job, the roadway to the Overwatch League could very well be in his sights considering Florida’s ambition to incorporate Academy players into their main roster. With Overwatch’s new guidelines for a more competitive region in North America with soft ‘region locked’ player rosters and less splits overall, the new outlook for success is much different than previous years. To succeed at this level Mangachu will need to impress against the more accomplished teams and Mayhem Academy gives him the best platform to do so. New York Excelsior implode their academy team for ‘local’ talent, but is it the right move?